A Beautiful 5 Bedrooms 3 Bathrooms Villa. Just 12 minutes drive from Disney. And just three miles from US Highway 192.Perfectly located whether you are touring the theme Parks or just spending a relaxing day by our private Pool and Jacuzzi. Our villa is 3028 Sq. 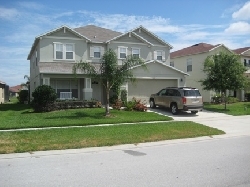 ft Ideal for 2 families sharing together. Large master bedroom with King Size Bed unsuited. Second Master Bedroom with King Size Bed. Two Twin Bedrooms. Cable TV in all Bedrooms. 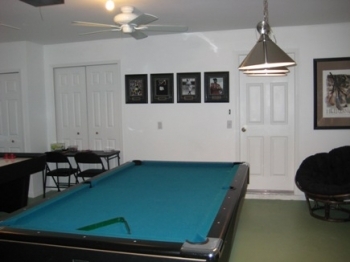 Our Games room has a Pool table, Air Hockey, Table Tennis, Soccer game table. Dart Board game. Ceiling fan and Air-Conditioning. A large Family Room with a 52" Digital High-definition TV, with on screen guide with a big choice of channels, DVD. The Living Room is a second family room here you can sit and quietly read, away from the distraction of the Television. There is ample seating in the two comfortable sofas, and Ceiling fan to keep you cool. The Dining area has a large dining table with seating for 6. A fully equipped Kitchen. Full size Refrigerator/freezer with Water and Ice dispenser. Built in Electric Stove/Dishwasher/Garbage disposal/Electric Griddle/Coffee Maker/Kittle/Blender/Glassware/Dishware/Silverware. Utility Room with full size Washer and Dryer, Iron and Ironing Board. For informal dining there is. The Nook area with Breakfast Bar. With Direct access onto the Pool Deck. Our first floor Queen Bedroom has a Queen Size Bed Cable TV, Clock Alarm/radio. Closet and unsuited. Games room. Pool Table, Air Hockey, Soccer Game. Dart Board Game. Table tennis. And on our second floor we have a Loft/Den area. And is equipped with Cable TV, Ceiling fan. Clock alarm/Radio, telephone. Our Second King Bedrooms has a King Size Bed. Cable TV, Clock Alarm/radio, Ceiling fan walk in closet, family Bathroom. The remaining Bedrooms are both Twin Rooms. Each Bedroom has twin Beds both with walk in closets. Cable TV. Family Bathroom. And for our younger Guests we have a 1 Baby Crib and 2 Travel Cots, Highchair. One of the main features of the Villa is the 28ft x 14ft.Pool and Jacuzzi with Lake View. Underwater Pool and Jacuzzi Lighting. Fully screened Pool Deck. And in addition to the Pool and Jacuzzi, There is a large Sun Deck with Loungers, Plus a table and chairs for when you decide to eat lunch out by the Pool. Part of the Deck is covered offering welcome shade; When the Mid-day Sun gets too Hot! Our Pool has Child Safety Fence, Pool Door Alarm. Pool side our home has a Security system.